A few months ago I stumbled across this recipe on Rasa Malaysia (a great cooking blog), and when I tried it, it was very much like the dish I remember. Even better, this is a SUPER easy and quick weeknight meal. If you have prepared rice in your fridge or freezer, you can have this on the table in 15 minutes. This can be doubled, tripled, etc. Heat cooking oil in a medium skillet or wok on medium high heat. Whisk eggs together with sesame oil and rice wine, and add to hot pan. Stir eggs gently to form large curds. 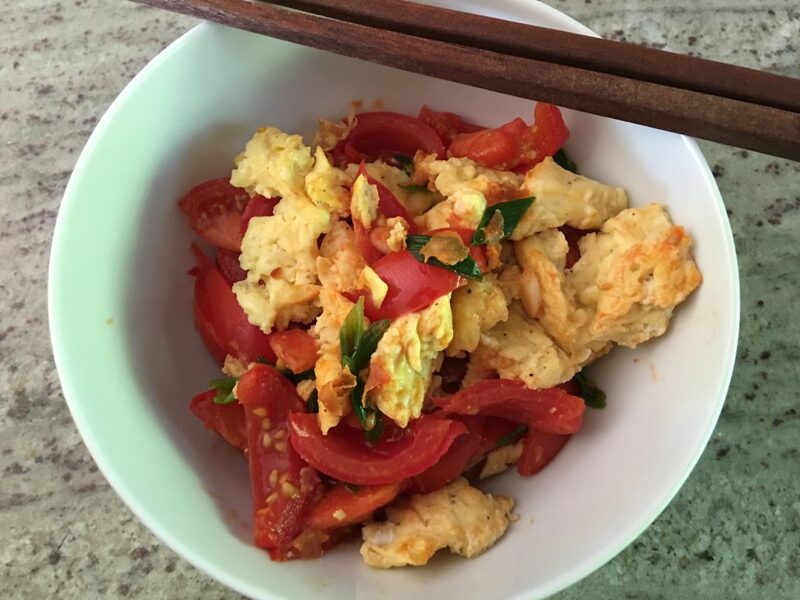 When eggs are soft-scrambled (~2 minutes), push them to the edges of the pan and add tomatoes. Cook tomatoes for 2-3 minutes, seasoning with a pinch of sugar and salt and pepper. Add scallions and toss mixture to combine.